Exo Terra Adult Bearded Dragon Food Contains Natural Plant And Fruit Ingredients Providing A Complete Diet For Your Bearded Dragon. It Is Carefully Formulated With Premium Ingredients With Added Vitamins And Minerals To Ensure Long Term Health. 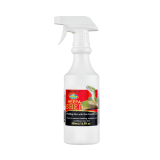 This Api Turtle Water Conditioner Removes Chlorine And Chloramine From Tap Water Making It Safe For Your Aquatic Reptiles And Amphibians, Reducing Eye And Skin Irritation In Your Pet. The Ecotech Mini Heat Mat Is A Small Sized Mat Designed To Provide Localised Heat In Small Enclosures. Suitable For Hermit Crabs, Spiders, Scorpians Or Any Small Animals. The Mat Contains An Adhesive Back For Quick And Secure Application.